In recent years, functional connectomics signatures have been shown to be a very valuable tool in characterizing and differentiating brain disorders from normal controls. However, if the functional connectivity alterations in a brain disease are localized within sub-networks of a connectome, then accurate identification of such disease-specific sub-networks is critical and this capability entails both fine-granularity definition of connectome nodes and effective clustering of connectome nodes into disease-specific and non-disease-specific sub-networks. In this work, we adopted the recently developed DICCCOL (dense individualized and common connectivity-based cortical landmarks) system as a fine-granularity high-resolution connectome construction method to deal with the first issue, and employed an effective variant of non-negative matrix factorization (NMF) method to pinpoint disease-specific sub-networks, which we called atomic connectomics signatures in this work. 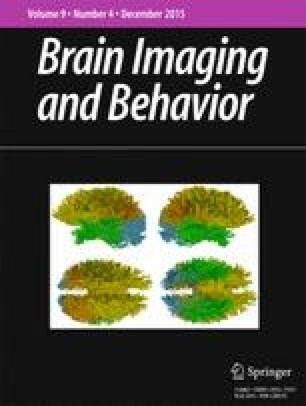 We have implemented and applied this novel framework to two mild cognitive impairment (MCI) datasets from two different research centers, and our experimental results demonstrated that the derived atomic connectomics signatures can effectively characterize and differentiate MCI patients from their normal controls. In general, our work contributed a novel computational framework for deriving descriptive and distinctive atomic connectomics signatures in brain disorders. T Liu was supported by NIH R01 DA-033393, NIH R01 AG-042599, NSF CAREER Award IIS-1149260, NSF CBET-1302089 and NSF BCS-1439051. J Zhang was supported by start-up funding and Sesseel Award from Yale University. The authors would like to thank the anonymous reviewers for their constructive comments. Jinli Ou, Li Xie, Xiang Li, Dajiang Zhu, Douglas P. Terry, A. Nicholas Puente, Rongxin Jiang, Yaowu Chen, Lihong Wang, Dinggang Shen, Jing Zhang, L. Stephen Miller, and Tianming Liu declare that they have no conflicts of interest. Arbabshirani, M. R., Kiehl, K. A., Pearlson, G. D., & Calhoun, V. D. (2013). Classification of schizophrenia patients based on resting-state functional network connectivity. Frontiers in Neuroscience, 7. doi: 10.3389/fnins.2013.00133. Fornito, A., & Bullmore, E. T. (2014). Connectomics: a new paradigm for understanding brain disease. European Neuropsychopharmacology. doi: 10.1016/j.euroneuro.2014.02.011. Lancichinetti, A., & Fortunato, S. (2012). Consensus clustering in complex networks. Scientific Reports, 2. doi: 10.1038/srep00336. Rubinstein, R., Zibulevsky, M., & Elad, M. (2008). Efficient implementation of the K-SVD algorithm using batch orthogonal matching pursuit. CS Technion. doi: 10.1.1.182.9978.